What is the relevance of Harappan civilization in today's world? This is probably the most intriguing question of the list. Still nobody really knows. To know where we are going, it is useful to know where we came from. Harappan civilisation is amongst the first major urban civilisation that stretched over an area of 1.5 million square kilometres (the size of a modest sized modern country). It was highly standardised architecture, art and utilitarian items. It traded over an even larger area, getting raw material and exporting (to region where its standardisation rules did not apply) finished products, traders and some of its habits to different regions. It post-dated the great cultures of Mesopotamia and was contemporaneous to Sumerian cultures. However, it received a lot of ideas also from Central Asia and in many ways, it collected the finest of ideas and technologies. In that sense it is relevant and important. The fact that it built not grand structures (but its cities like Harappa were built on artificial mounts) and had no grandiose armies etc. made a lot of archaeologist consider it ‘boring’ and only recently Science ran a series of articles about the culture calling it ‘not boring anymore’. Hence Harappa was probably a very significant aspect of the great early cultures of South and Central Asia and in many way laid out the habits, attitudes, responses, and standards that have become ingrained in us today. Unfortunately Harappa has not attracted enough of the kind of scholarship that say, Central Asia has, for a variety of reasons. We therefore have only the most peripheral understanding of one of the important parts of cultures that extended from the Levant to Bramhaputra and the Persian Gulf to Central Asia and Turkey. So this culture must have played a very significant role in setting up the standards on which later cultures and civilisations were built upon. But we seriously lack an understanding of this aspects of foundation of the human race. Among other things, the Harappan civilization provides important insights into the relationship between civilizational collapse, violence, and disease. Global bodies and governmental organizations seeking to make predictions about global warming in the contemporary context have essentialized the relationship between climate change, environmental migration, and violence. The Department of Defense is very invested in this narrative, for example, which they have derived from something called the Human Security literature. I recently wrote a chapter about this for a forthcoming volume edited by Jane Buikstra. These ideas about a “natural” tendency for humans to respond violently to resource stress and immigration are dangerous because they create narratives that can be easily twisted into a justification for public policies that harm refugees and vulnerable populations in favor of American supremacy. The evidence from the Harappan civilization demonstrates that there was very little interpersonal violence in the urban period at Harappa, despite centuries of immigration, climate, social, political, and economic changes. It was not until the city of Harappa was largely depopulated that we see a dramatic increase in violence and the effects of new infectious diseases in the population that (for whatever reason) chose to remain in the city. Furthermore, while interpersonal violence and infectious disease were part of the urban experience of “collapse”, research across rural areas in village India during a period of environmental change a millennium later demonstrates that agrarian populations were more likely to suffer food shortages and high levels of infant mortality. Violence and disease were not inevitable consequences of climate and other changes at the end of the Harappan era. Instead, they were products of particular social and historical circumstances, which created social inequality and left segments of society more vulnerable in the late period. This is important because governments at meta-governmental bodies are organizing around the idea that climate change will lead to environmental refugees and that if human nature is inherently violent, we should prepare to violently meet the inevitable increased competition for resources. Harappa and the succeeding Deccan Chalcolithic period demonstrate that history and social forces are more important in shaping particular contexts, meaning, and human responses to dramatic changes. Violence is only one option and it is exercised in particular kinds of places at particular times. Harappan civilization forms an important landmark in the prehistory of the Indian subcontinent. The civilization offers an excellent example to the modern world in various ways. Their expertise in town planning, water management and harvesting systems as well as drainage mechanism is unparalleled. They had public and private wells at most of their sites and their houses were often equipped with bathing areas and toilets. They were also technologically very advanced in pyrotechnics and metallurgy. Their craftsmanship is evident in their beads, jewelry, pottery, seals as well as other artifacts made of metals and their alloys. Their trade networks were also quite widespread. They had standardized weights and measures. They often used standardized bricks in their architecture. 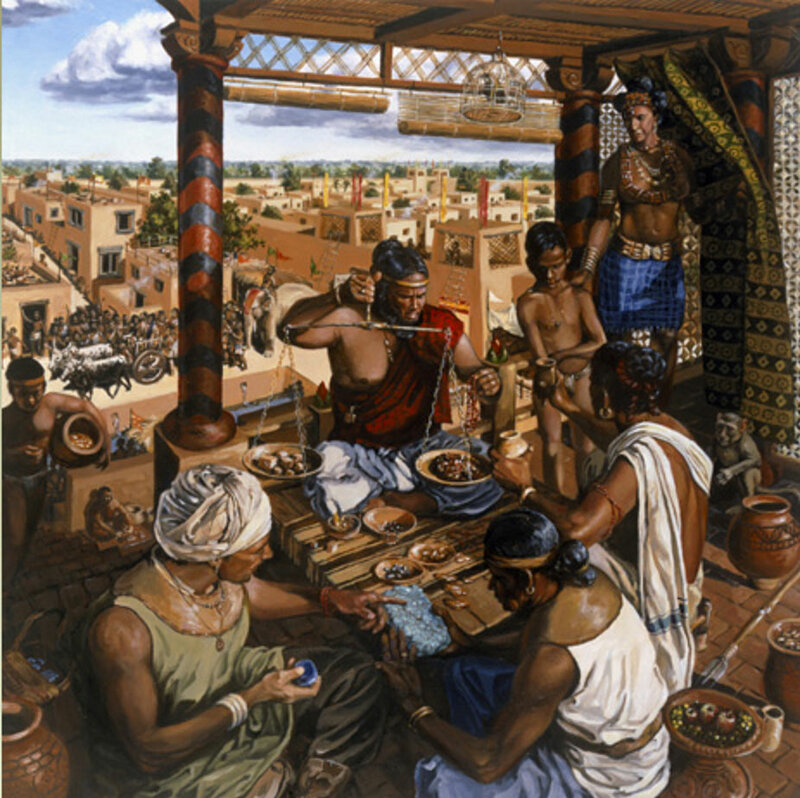 Recent research has suggested that Harappan people were probably the first ones to introduce silk and lost-wax casting techniques. No large-scale weapons have been discovered from the Harappan sites which also suggests that they did not indulge in warfare. The occurrence of the first civilization from which the emergence of the city and urbanism can be understood. The Indus civilization takes its place with its contemporaries in Mesopotamia and Egypt as the earliest civilizations in the Near East/South Asia. Their ways of life are part of the history of human kind.